Probate is the legal process used to settle a person’s estate after their death. Probate is necessary if the decedent dies leaving assets in their name alone, without joint owners or beneficiaries listed. In Florida, there are three different ways to administer an estate which can be distinguished by the value of the assets that will be included in the probate. Some assets are not included in the probate estate as they are transferred after an individual passes through other means. Assets that are titled jointly will pass automatically by operation of the law to the surviving owner. Other assets, such as bank accounts or life insurance policies that have a beneficiary designated can be transferred by contacting the financial institution where the assets are held, providing a death certificate and completing the necessary paperwork. Additionally, assets held in Trust are not included in the probate estate and are distributed by the Trustee. Once it is determined what assets will be included in the probate estate, the next step is to determine the value of the assets. By knowing the total amount of the probate estate, you can determine which probate process will be required. You are not required to retain an attorney to proceed with administering the estate in this situation. If there is an original Last Will and Testament, it is to be filed with the Clerk of Court in the County were the decedent resided within ten (10) days following their death. A Summary Administration is a shorter probate process that can be used in two different situations. First, it can be used for estates that do not exceed $75,000 in value, excluding the value of any exempt property (the homestead, personal vehicle and tangible personal property up to $20,000.) The second scenario when a summary administration can be used is when the decedent has been deceased for more than two (2) years. Any party listed as a beneficiary or designated as the personal representative under the will, or an heir of the estate pursuant to Florida Statutes if someone passes without a will, can petition the court for summary administration. All interested parties, which include minor children, the surviving spouse, beneficiaries under the will, or heirs at law, are required to consent to the Petition or be served with formal notice and given the opportunity to object. To begin the process of filing for summary administration, the person who was named as the personal representative (also known as the executor) in the will, or anyone else inheriting the estate, files a form called a Petition for Summary Administration. If there is a surviving spouse, he or she must also sign this petition. If one or more beneficiaries do not sign the petition, you are required to formally notify them of your filing. Like the Disposition of Personal Property without Administration, the petitioner shall disclose to the court the assets of the estate, the value of the assets, and the interested parties of the estate. In addition, the death certificate, proof of payment of funeral expenses, and the original will shall be filed with the Petition. If the estate qualifies for summary administration and no objections are filed, the Court will enter an Order of Summary Administration which is the document that identifies who the assets shall be transferred to. This process can be as short as a few weeks from start to finish. 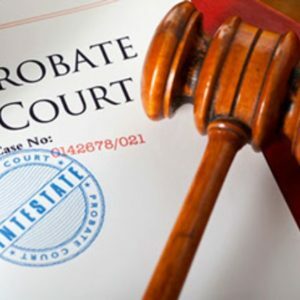 If the decedent has not been deceased for more than two (2) years, the probate process may take as long as three (3) to four (4) months if notice is published to creditors to shorten the time period for creditors to file a claim against the estate. The longest and most detailed process of the three is a Formal Administration. This is the probate administration that would be used for an estate that has assets collectively valued at over $75,000 (excluding exempt property). It is also the preferred process if there are several known creditors of the estate or creditors who are owed large amounts of money. Usually, this process takes between six (6) months to a year to finalize. In a Formal Administration the Court will appoint a Personal Representative to handle the estate. The Personal Representative must be represented by an attorney unless the Personal Representative is the sole beneficiary of the estate. The designated personal representative or an interested party may petition the court to open the estate. The petition must be filed in the county where the decedent resided. As with a summary administration, the death certificate, the original will, and proof of payment of the funeral expenses shall be filed with the initial petition. With the court’s supervision, the personal representative shall file an inventory identifying all of the estate assets, address all debts of the estate, and arrange for settlement of any taxes. Once all of the assets of the estate are collected, the time for creditors to file claims has expired, payment has been made to settle any final taxes of the decedent or the estate, and payment has been made to those creditors entitled to payment, the personal representative can make distribution of the estate assets. Once the above has been finalized and the assets of the estate have been distributed, the estate can be closed. Choosing the correct method to address a decedent’s estate can be a difficult and confusing process. It is best to consult an experienced estate attorney before beginning the proceedings. Even in the case of a seemingly simple estate, complicated legal issues can arise. If you are the personal representative of the estate, or if you have recently lost a loved one and have legal concerns, please contact me today.